The Virgin Mary embodied power rather than maternal tenderness in the Byzantine world. Known as the Mother of God, she became a guarantor of military victory and hence of imperial authority. In this pioneering book, Bissera Pentcheva connects the fusion of Marian cult and imperial rule with the powers assigned to images of this All Holy woman. Drawing upon a wide range of sources and images, from coins and seals to monumental mosaics, Pentcheva demonstrates that a fundamental shift in the Byzantine cult—from relics to icons—took place during the late tenth century. Further, she shows that processions through the city of Constantinople provided the context in which Marian icons emerged as centerpieces of imperial claims to divine protection. Pentcheva breaks new ground, contending that devotion to Marian icons should be considered a much later development than is generally assumed. This new perspective has important implications not only for the history of imperial ritual but also for understanding the creation of new Marian iconography during the twelfth and thirteenth centuries. 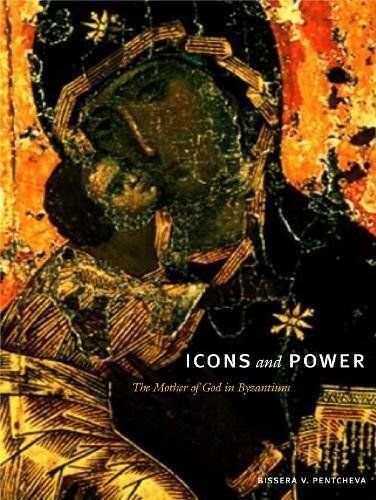 Centered upon fundamental questions of art, religion, and politics, Icons and Power makes a vital contribution to the entire field of medieval studies. It will be of interest as well to all those concerned with the cult of Mary in the Christian traditions of the East and West.